In his new book The Matchmaker of Kenmare, Irish novelist Frank Delaney sends his characters on a tour of World War II-era Ireland. Soon, they become sucked into the era’s foggy diplomacy, visiting the war-town landscapes of both England and Germany. These characters are able to move around without raising too much suspicion, in part, because they are from Ireland, and Ireland, of course, was neutral during World War II. We can argue some other time about Irish neutrality in the face of Nazi barbarism. What this does remind us of is that people – and nations – have had to make tough choices in the past. During World War II, the Irish weighed their unique history with British imperialism against the realities of 1940s politics and made their choice. This is interesting to think about as British and American politicians are now saying some provocative things about religion, immigration and terrorism on both sides of the Atlantic. Over in Great Britain, Conservative Prime Minister David Cameron blasted the very concept of multiculturalism. 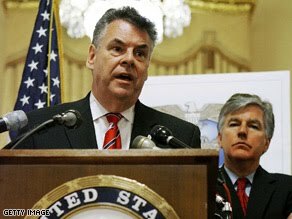 Meanwhile, on this side of the Atlantic, Congressman Peter King, new chairman of the House Homeland Security Committee, prepared to hold hearings next month which will focus on the role Muslim Americans have played -- or not played -- in foiling home-grown terrorist plots. King, for years a well-known presence in Irish American circles, is no knee-jerk immigrant-phobe. Indeed, there is understandable concern on both sides of the Atlantic about terror, and about whether or not immigrants are assimilating, or are instead participating in plots to destroy the very nations they once chose to adopt as their homelands. Which brings me back to World War II. Let me call upon another expert, though not a novelist or congressman or prime minister. My mother grew up in 1940s Brooklyn, when another global war was raging. In talking to her over the years I’ve gotten a fairly strong sense of what her block in East Flatbush was like, in part because there were many other blocks just like it. It was -- though no one used this word back then -- a “multicultural” block. Mostly white ethnic, with plenty of working class Irish, German and Italian Americans. That bears repeating because, as any regular viewer of the History Channel knows, among our enemies during World War II were … the Germans and the Italians! The Irish, of course, were no enemy. They were simply neutral. Which is kind of how some Fox News devotees view the French these days. It’s not that they’re against the global war of terror. They are just kind of neutral. The point is not that everyone on my mother’s block got along. From what I can tell my grandmother showed no prejudice, mainly because she hated everybody. But here, living side by side, were the children of immigrants from nations the U.S. was fighting a bloody war against. Yes, of course, there were spasms of anti-German sentiment, and some Italian-Americans were indeed sent to camps, and a handful of rough Irish kids teamed up with members of the German American Bund and dreamt up terrible anti-Semitic conspiracy theories. But in their day-to-day lives that multicultural Brooklyn block endured. And did so under circumstances that seem more disturbing than our current concerns over terror and multiculturalism. Yes, we should be vigilant, and we should demand that immigrants grasp what is great about America. But there is a fine line between vigilance and fear-mongering. We want our immigrants to know what is great about America. But it seems as if the native-born also need to be reminded from time to time.